The reviews were rarely good. Even in Spokane. 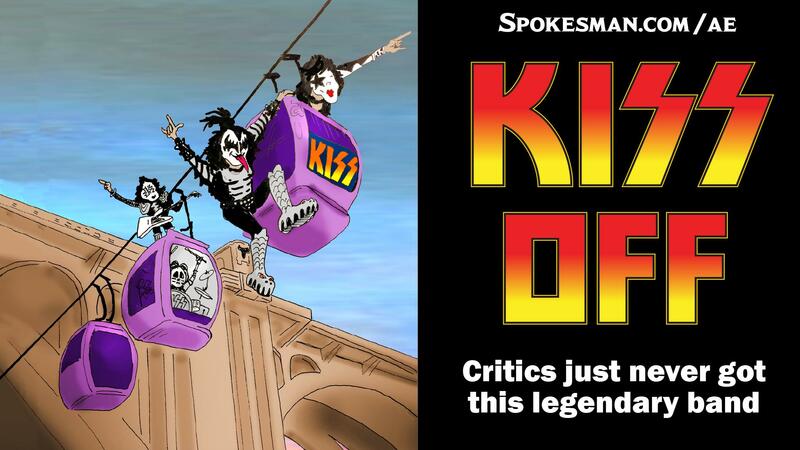 When KISS played at the old Coliseum back in August of 1977, our newspaper’s reviewer was less than impressed. Which is precisely what the critics never understood about the hottest band in the world. KISS is the Rodney Dangerfield of rock ’n’ roll. They get no respect. Except from the one place they want it: the band’s fans. Count me as one of them. A huge one. Years ago, as the editor at The Orange County Register, I once took all of the other editors to a KISS concert for the loudest newspaper meeting ever held. Even here at The Spokesman-Review, when I have a big meeting where it’s important to at least try to dress like an adult, I’ll wear a suit jacket, a nice button-down shirt and French cuffs … except my cuff links are the KISS logo. Even if that means ignoring the critics who work at the same newspaper as me. I couldn’t count how many times I’ve seen KISS in concert, but if I had to, it’d more than 15 but less than 30. I’ve taken my kids to see them. Numerous times. We’ve previously bought the meet-and-greet packages so we could get a family photo with them. On one of those occasions, Gene Simmons told my daughter that he had boogers in his nose that were older than her. That’s not only a fantastic family memory but also an important reminder to always carry Kleenex. Despite seeing the band that many times, Monday’s show at the Spokane Arena feels different. KISS says this it. Finito. The end of the road. No more tours. No more confetti cannons. No more gigantic light shows that can be spotted from orbit. It feels believable. Credible, even. This seems like it might actually be the last go round for my masked musical heroes … especially when you compare the ticket prices to next week’s show to the last time the band was in town just a couple of years ago. Definitely feels like they’re making this one count. My checking account agrees. Oh sure, KISS said the same thing in 2000. They even called it “The Farewell Tour” back then. But no one really believed them. The dollar was strong and the crowds were big – two things the band both appreciates and understands. That was two decades ago. Which was basically two decades after the band was initially founded. You can do the math here. They’ve been around for awhile. A long while. Even if you’re in better shape than most 20-year-olds – and Paul Stanley is – it’s still hard to rock ’n’ roll all night and party every day when you’re in your late 60s, have had hip-replacement surgery and your job requires you to wear a 40-pound costume, 8-inch platform heels and more makeup than a Disney princess. Besides, this final tour isn’t going to be one of those cute little outings that basically lasts a summer. Plans are for this tour to last multiple years, with the band playing in basically every town with electricity. When it’s finally over, founding members Stanley and Simmons will both firmly be septuagenarians. I can only hope to be that active when I’m 70, though there’s tangible evidence that I’m not that active in my 40s – which oddly makes me wonder if they have any sparkly platform heels in my size over at that fancy Nordstrom store just up the street. So, how did the critics get it so wrong for so long? Because there really wasn’t anything like KISS before there was a KISS. For most critics, the band begins and ends with its over-the-top – though now iconic – makeup and outrageous comic-book costumes. This wasn’t what serious musicians looked like. Then there was the spectacle of the band’s live performances. Serious musicians certainly didn’t blow fire or spit blood on stage or had guitars that shot rockets. Important bands didn’t blow up more fireworks at their shows than the Fourth of July at a Spokane Indians baseball game. KISS never wrote complicated songs. They played fun songs. They unapologetically wrote singalong anthems with Stanley never getting proper credit for having one of rock ’n’ roll’s coolest voices. Their legendary shows were designed to make you talk about them for days because you’d never seen anything like them. For more than 45 years, people have flocked to KISS shows and bought their albums in staggering numbers. They’ve sold more than 100 million records worldwide and their 30 gold records ranks as the most of any American band in history. You read that right, any American band. People are buying more than just the band’s music. The band practically invented music merchandising, first with concert shirts and other basic concert memorabilia then on to everything from action figures to comic books to even coffins. Yes, you can head into the afterlife in casket adorned with the images of your favorite kabuki-makeup-wearing band. There are KISS cruises. The band even owned an Arena League Football team that was named, you guessed it, KISS. There was a popular reality TV show a few years ago that followed Simmons and his family, showing that the demon-faced rocker known more for his massive tongue than his massive heart was actually a big softie who adored his family, with a wonderful wife who clearly has him wrapped around her little finger. This week’s concert in Spokane includes a $5,000 ticket with too many features to mention, but highlights include meeting the band, a pre-concert visit to the stage, getting to hold the band’s guitars and even getting to try on the band’s famous footwear. If things like food, rent and car payments weren’t important for a couple of months, I would have bought one. Critics may not have loved KISS, but other musicians certainly did. The bands who list KISS as a big influence is literally a who’s who of the music industry, including some of Washington’s most beloved bands. Pearl Jam. Soundgarden. Alice In Chains. Last year, country music superstar Garth Brooks played seven sold-out shows in Spokane. And guess who is one of Garth’s favorite bands in the world? The Rock & Roll Hall of Fame has all sorts of criteria for a band to be eligible for entry. KISS met every single requirement, except that inclusion was ultimately decided by a group of notable music critics, meaning there was no way the band would ever be welcome. That’s what we call a “hard no.” Simply not happening. It wasn’t until a fan vote was added that KISS made it into the hall of fame. On the first try. And, let’s be honest, KISS wouldn’t have wanted it any other way. They were always a band that was built for fans, not music critics. That all takes me back to the band’s 1977 show here in Spokane. It was fellow Rock & Roll Hall of Famers Cheap Trick. That’s a show I would’ve loved to have seen. Two of my favorite bands. Together. In Spokane. Only I was in kindergarten. In Kansas. Still, I’m guessing my review would have been great. The handwriting would have been questionable because I didn’t know how to read yet, but there’s no doubt I would have loved the show. If you’ve never seen KISS before, this is your chance – likely your last chance. More importantly, go as a fan … not as a critic. The fans have way more fun. Published: Jan. 31, 2019, 6:24 p.m.